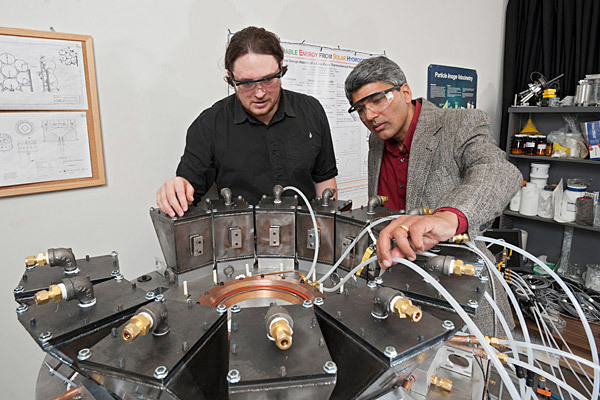 UD doctoral student Erik Koepf (left) and Ajay Prasad, professor of mechanical engineering, inspect the novel solar reactor. UD doctoral student Erik Koepf will test his novel solar reactor in Switzerland. 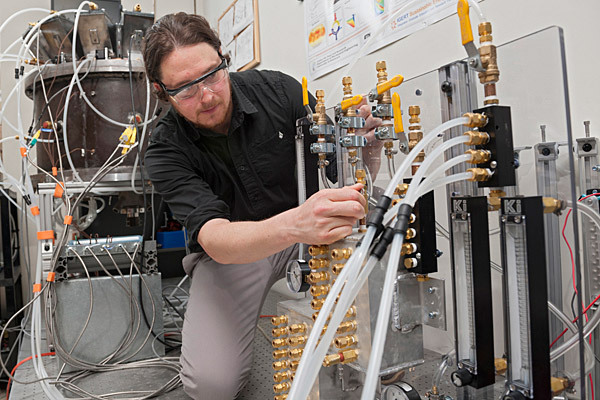 9:18 a.m., April 3, 2012--Producing hydrogen from non-fossil fuel sources is a problem that continues to elude many scientists but University of Delaware’s Erik Koepf thinks he may have discovered a solution. Hydrogen is traditionally made from natural gas. Unfortunately, natural gas is a fossil fuel that releases carbon dioxide, a greenhouse gas, when converted to hydrogen. Koepf, a doctoral candidate in mechanical engineering, has designed a novel reactor that employs highly concentrated sunlight and zinc oxide powder to produce solar hydrogen, a truly clean, sustainable fuel with zero emissions. His advisers are Ajay Prasad, professor of mechanical engineering and director of UD’s Center for Fuel Cell Research, and Suresh Advani, George W. Laird Professor of Mechanical Engineering. “People have been trying for years to generate hydrogen renewably from sunlight, and Erik’s reactor takes us closer to that goal,” explained Prasad, principal investigator of the University’s fuel cell bus project, which uses hydrogen fuel to power its fleet. The reactor, which resembles a large cylinder, is comprised of layers of advanced, ultra-high temperature insulation and ceramic materials. It measures roughly 2 feet by 3 feet and weighs a hefty 1,750 pounds. The conical geometry of the reactor’ design uses gravity to feed zinc oxide powder (the reactant) into the system through 15 hoppers perched on top of the device using special gears and a custom built control assembly Koepf developed at UD. Cooling blocks embedded in the structure keep the motors, a quartz window and the aperture ring, where the sunlight enters, cool. “The idea is to create a small, well-insulated cavity and subject it to highly concentrated sunlight from above,” explained Koepf. Koepf has been testing the main control systems for his reactor in Spencer Laboratory for months. The missing ingredient, however, has been sunlight. Beginning April 5, he will spend six weeks testing the prototype’s effectiveness for the first time at the Swiss Federal Institute of Technology in Zurich. “We will measure the temperature and the production of oxygen inside the reactor in real time, which will tell us how much solar fuel or zinc we are actually producing,” Koepf explained. During testing, light concentrated to simulate the energy of 10,000 suns will be focused down into the reactor, sending the temperature within soaring to over 3,000 degrees Fahrenheit, nearly one-third the temperature of the sun’s surface. Once hot, the hoppers will feed zinc oxide powder (a benign substance resembling baking soda) onto the ceramic layer, causing a reaction that decomposes the powder into pure zinc vapor. In a subsequent step, the zinc will be reacted with water to produce solar hydrogen. Koepf calls his research a “potentially sustainable energy path for the future” and he is working to patent his design through the University’s Office of Economic Innovation and Partnerships (OEIP). “Doctoral students typically specialize in one area, but Erik’s reactor involves many different branches of mechanical engineering; notably fluid mechanics, heat transfer, reaction kinetics and experimental design,” Prasad said. One interesting feature of the reactor is that, in theory, the zinc oxide byproduct created during the reaction will be re-usable, making the project self-sustaining.